In its 14th year LondonEdge will once again present some of the worlds most creative and exciting ‘niches’ in fashion, footwear and accessories. This September, in addition to the almighty throng of new international brands, the LondonEdge show will play host to a fantastic range of new and edgy British brands and collections. Visitors can expect to see over 30 new, never seen before companies showing as many as 50 collections from all corners of the planet. These new products, such as headbands, jewellery, hats, fascinators, apparel and more, are influenced by everything and anything ‘niche’, alternative & indie ranging from vintage inspiration to 90s grunge. Vintage connoisseurs look no further… Lindy Pop’s 1950’s inspired fashion range of vibrant floral prints, Audrey Hepburn inspired floral swing dresses, bold Swing Jive and Wiggle dresses are at the heart of the vintage fashion scene. Focusing on the female form, the dresses are designed to enhance the body shape and ensure vintage lovers don’t blend into the background. To complete the 1950’s look, Be Bop a Hair Bands wired hairbands and full head turbans are inspired by all the glamour of the 50’s. These super glam, double sided headpieces are available for adults and retro cool kids who want to encompass retro hair-dos. Vintage enthusiasts and buyers should also stop by The Seamstress of Bloomsbury whose authentic 1940’s collection is dedicated to the work of Miss Lillian Wells and focuses on the seamstress’s exquisite patterns and design. If you enjoy swing dancing and dressing in genuine vintage swing clothing, then you will want to check out The Seamstress of Bloomsbury. Amongst the new British brands exhibiting look out for Skull Studio who will be presenting their specially selected range of men’s and women’s t-shirts inspired by skulls, gothic, heavy metal, tribal designs and fantasy. All the unique artwork is designed by professional artists ensuring buyers are donning a high-quality and distinctive tee. Fortune favours the bold and La Mort Clothing of London with be celebrating this concept at LondonEdge with their The Narcosis Collection. Their original brand of funerary art fuses timeless iconography with a slick, urban sensibility, and this release perfectly showcases the macabre, emotive style for which they have become renowned. The Narcosis Collection includes a range of men’s and women’s apparel, with full-chest prints and poster-style graphics. 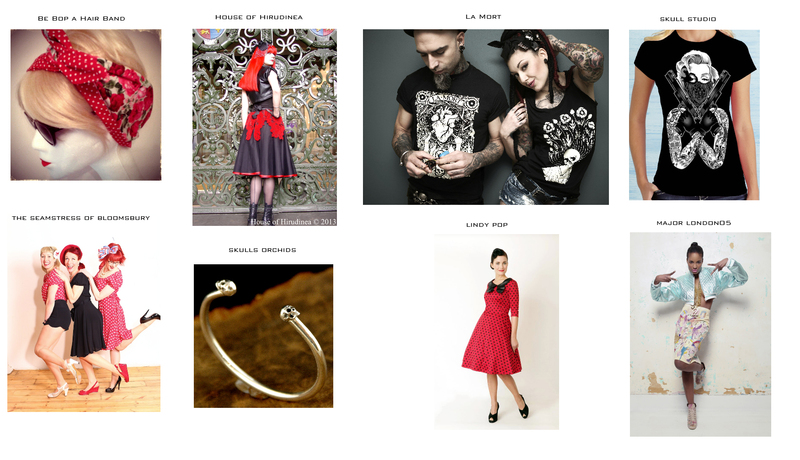 La Mort Clothing should not to be missed. Those with a passion for dark fashion should also head to the House of Hirudinea stand where this London based company will debut it’s first collection. An eclectic fusion of vintage, avant garde and macabre influences blend together to produce a range of clothing and accessories spanning the gothic and steampunk subcultures for both men and women. Handmade in the UK, House of Hirudinea offers a decadent twist to alternative fashion that has been thrilling customers already and LondonEdge are thrilled to have them on board for their first exhibition. For jewellery and skulls lovers alike, Skulls and Orchids is a must! This unique handcrafted jewellery brand will be presenting their sensational new collection of contemporary gothic and retro urban jewellery, exclusively designed and produced by designer Steven Dennis. Jewellery admirers can also enjoy the fresh new designs from Manchester based Heikitchi. Offering a vast collection of body jewellery and fashion accessories, Heikitchi’s range of belly button rings, tongue rings, nose rings, belly chains eyebrow rings, necklaces, bracelets, anklets, toe rings and more, focus on value, quality and design. Amongst LondonEdge’s huge British brand offering Major London05 will be showcasing their hip-hop and 90’s inspired collection to all. Carefully crafted using different techniques ranging from hand graffiti, embellishment and applique lace, to knitted yarn-incorporating chain, the line oozes luxurious urban appeal. The diverse use of fabric is made to style and suit various tastes with Denim, plastic coated lace, leather, jersey, sequin fabric and mesh just some of the fabrics used to create a fresh urban look whilst representing high fashion sportswear. With so many new British brands on offer it’s hard to believe that this is just a taste of what’s to come at this September’s event. If you wish to be reminded of last years event, you are welcome to read the LondonEdge September 2012, article posted here on the Fashion Blogger. You may also want to read up on The Ledge 2013 as well. This entry was posted in Fashion, Fashion Blog, Fashion Brand, Fashion Events and tagged British brands, fashion brands, fashion event, london, Londonedge, trade show. Bookmark the permalink.